W e publish herewith another series of drawing from photographs taken by our special reporter (Charles Kerry) with the Kosciuszko Observatory Expedition. The two large block are from negatives obtalnet on the moring of the departure from the submit, and they show the observing station as it will stand for the next two or three months or longer, as circumstances permit. Mr. Wraggge hope to make it a permanent station before very long, but it that cast more substantial structures will be required, besides store-rooms for the winter provisions. The small blocks give some idea of the sort of work accomplished by Mr. Murray Napthali, who was in charge of the three-horse day which made a remakable ascent from Jindabyne to was very submit of the mountain. The dray when photographed was just on the point of crossing the last snowdrift which adorns the sides of the submit. It was heavily loaded with provinsions and implements of all kinds, but it had scaled even steeper declivites thun this in the course of its journey upwards, in some places the drivers had to cut away timber and roll boulders out of the road in order to effect a passage, while elsewhere they had to drag it through bogs which buried it up to axels. It is said that on one previous occasion a buggy and pair accomplished the ascent-that is, when the surveyor carred up the post which now forms part of the „trig” carin-but Murray was the first to engineer a heavy dray from Jindabyne to the submit. The Observatory as it now stands is shown beneath. In the foreground to the left, near the podkreślamy [see the figure1 at the bottom] is one of Mr.Wargge's tropic rain gauges. It is fixed in the ground securely at the standart heigh, viz, the rim 2ft. above the surface. Near the figure 2 will we notticed a heap of stones. This is known as a „carin”. It is built up to a height of about 3ft., almost conical and hollow. Inside it, is netted a long box which holds the moutanian barometer - the most important instrument in the whole Observatory. The barometer is slung from a hook in the top of the box. 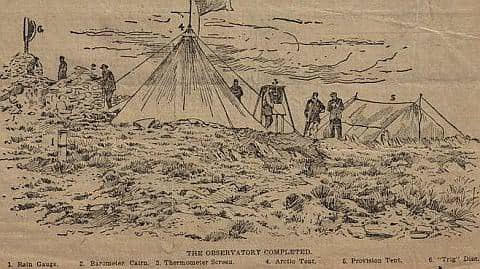 There is a opening in the side of the carin nearest the Arctic tent (marked No.4 in the drawing), so that the observers in bad wether can almost take a reading without going outside their shelter. This would only be possible if the lid of the barometer box were left open, but it is not. Anyhow, it is only a couple of paces from the tent to the carin. The tent itself, as before stated, is built very strongly of hurricane canvas. It is 14ft 6in square, and well lined with grass. The centre pele is punk about 3ft. in to the ground so that. It would anlmost stand without the goya?. In fact, it was bullt to stand without them. To the right of this tent is the Stevenson double-louvred (screen marked No.2 in the block) which bolds the four thermometers and other standard instruments. There are the dry and wet bulbs and the „max” and „min” thermometers. This is raised to the height of 4ft. above ground. When photographed the lid or door was let down. The provisions for the observers, their cooking apparatus, which includes a kerosene stove, and other impedimenta, are all stored in the tent to the right marked No.5. This is one of the tents used by several members of the party for sleeping in during the time we were camped on the submit. The „trig” sickwhich marks the highest spot in Australia, is shown us No.6. The stones which support the centre pole to which the disc is attached from the recepaticle for visiting cards, and memos, left by tourist, surveyors, and others who climb the peak during the summer months. On our arrival at the summit we foraged in all the crevicen and unearted quite a stack of cards, bearing the names of well-known people. Surveyors who bad hat occasion in visit the summit during bad weather had also left memoranda with jocular references to some of Mr. Wragge's pet disturbances to which they aattribted thier ill-fortune. The thrid block publlished contains portraits of the members of the observing staff, permanent and otherwise, taken just in front of their tent. The tall, full-lenght figure to the left is Mr. Wragge, marked No.1. Capitan Illiff (No.2) Is left as general manager of the Observatory camp. He is responsible to Mr. Wragge for the conduct of the work: Mr. Fowles (No.3) accond assistant at the Queensland Weather Bureau, accompained the expedition by way of a holiday trip. Mr. Burg Newth (No.5) is the second. Mr Bernard Ingleby (No.4) is the principial observer of the Kosciuszko permanent staff, and Mr. De Burg Newth (No.5) is the second. Mr. Wreagge's son Clement Egerton Wragge (No.6) assisted in the establishment of the high-level station, and now goes down to Merimbula, on the South Coast, to take charge of the corresponding low-level station.